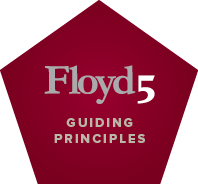 Floyd Advisory is a consulting firm providing financial and accounting expertise in areas of business strategy, valuation, SEC reporting, and transaction analysis. Our mission is clear: to be the market-leading service provider that is defined by integrity, quality, objectivity, responsiveness, and professionalism. Our commitment to this mission defines all that we do and is reflected in the deep and trusted relationships we form with our clients and the value we provide on their behalf. Our clients’ interests are always put first. We consistently serve our clients with our best efforts. We communicate to our clients with maximum clarity and completeness. We are committed to recruiting talent with a high level of curiosity, believe that success comes from collaboration, dedication to continuous self-improvement, and the ability to execute on ideas on behalf of our clients. We are counted among the esteemed thought leaders in our profession. We publish articles, serve on panels, and produce timely and relevant research on the issues affecting our clients and the industries we serve. Our passion to serve and enthusiasm for our engagements are defining traits for our people and our brand. Our responsiveness is unmatched. We actively participate in the communities in which we live and work. Giving of our time and resources is the key driver to problem solving in our communities and in the services we provide our clients. Our people are proven leaders with a solid foundation in accounting principles, financial reporting matters, financial statement analysis, investigative skills and finance.